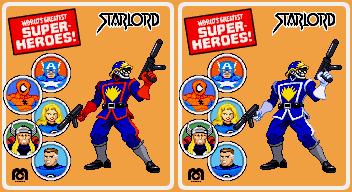 A new sprite of Star-Lord (in his Annihilators-era uniform and snazzy helmet) has been added to the Marvel Comics sprite gallery. Star-Lord (again, Annihilators-era) and Guardians of the Galaxy both get a mini-logo added to the Marvel gallery. The sprite and logos have been added to the GFX Generators! I’ll have a small set-up at All American Comics in Warren, OH (check ’em out on Facebook and Yelp) this Saturday for the Free Comic Book Day event. I’ll have some prints (not everything, still need to restock) with me and they’ll be at the sale prices I’m using on the site now, so you won’t even have to pay shipping if you can make it there. All American is a great shop that I’ve bought from for decades now, so check ’em out if you can make it to the NE Ohio area! I’m still working on those pixel art commissions, with 9/16 of one batch done, 2/10 of another done and another single sprite to do, so the content train will be kinda light for a while. Sorry for the low content, but this site will be more active again probably around late May. Don’t worry, more new sprites (and more) are coming! Meanwhile, I’ve also got a new pic on the main Illmosis site!